What is pes transversovalgus and how does it arise? Pes transversovalgus is also known as “flat foot”. Numerous foot deformities are combined in this condition. The heel bone buckles inwards (club foot). The foot arches sink downwards (fallen arches). The metatarsal bones spread outwards (splay foot). Weak foot muscles and additional strain can flatten out the foot arch. The ligaments cannot hold the heel bone in its natural position any more. That’s why the heel bone buckles inwards. At the same time, the entire foot arch sinks downwards and the metatarsal bones splay outwards. This occurs with every tread the foot makes. The deformities that result from this can have a negative effect on posture and lead to pain in the knees, hips, back as well as even the shoulders and neck. 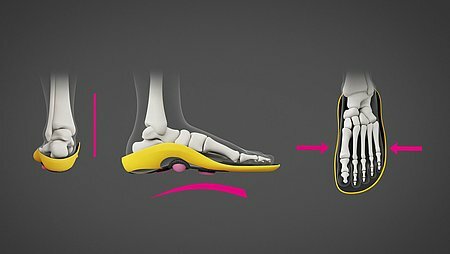 Individually fitted orthopaedic insoles support and can correct deformities by lifting the foot arch. Thanks to the defined heel support, the position of the heel bone is optimised. Foot deformities can be identified by a doctor or a insole specialist by examining the footprint or analysing the foot when walking and standing. The specialist will select the orthopaedic insoles according to the symptoms, shoe type and area of application. The insole will then be custom fitted. Orthopaedic insoles help to balance out foot deformities. They also promote healthy posture and can alleviate pain. In addition to treatment with insoles, we recommend that you train your foot muscles regularly. We’ve put together several exercises to help you strengthen your feet for long-term benefits. Lay half a tennis ball on the floor. Claw your toes in the floor and drag your foot in the direction of the ball. When your foot is by the ball, shoot it a little forward with your toes. Repeat many times and then use the other foot. Spread out a piece of newspaper on the floor. Stand with one foot on the paper and try to tear it up with the other foot. Then change the foot. Put a few marbles (or similar objects) on the floor. Try to lift them up with your feet and put them in a container. Change feet every time you successfully lift up a marble. Put a hedgehog or fasciae ball on the floor and massage the soles of your feet in circular movements. Support yourself against a wall, put one leg behind the other and stretch your calves. While doing this, the heel of the leg at the back should not leave the floor. Sit on a stool and put one leg onto the other leg with the ankle near to the knee. Hold your lower leg still with one hand and bend the toes in the direction of the soles of your feet with the other hand. Sit on a stool and lift up one leg. Pull your toes towards you, alternating your feet, and then stretch them away from you. Sit on a stool and lift up one leg. Now rotate your feet in both clockwise and anti-clockwise directions. Put one foot on an unstable surface (a thick cushion for example). Move the weight onto this foot and try to balance on one leg for a few seconds. Then repeat the exercise with the other leg. Find out more information about the orthopaedic insoles from medi here.